Educational Reconstruction, the twenty-five years of African American education, has two distinct periods – Freedmen’s School and State-Funded Public School eras. Before the failed passage of the 1890 Blair Education Bill, Tuscaloosa schools mirror those of Mobile and other urban districts of the state. While the University only allowed African Americans to work at the campus (above image), Henderson Johnson, Cornelius Garland, and others helped to secure a system of schools for the generation of freedom's children. The documents below detail the activities, teachers, expenditures, and major developments of the second period of Educational Reconstruction. 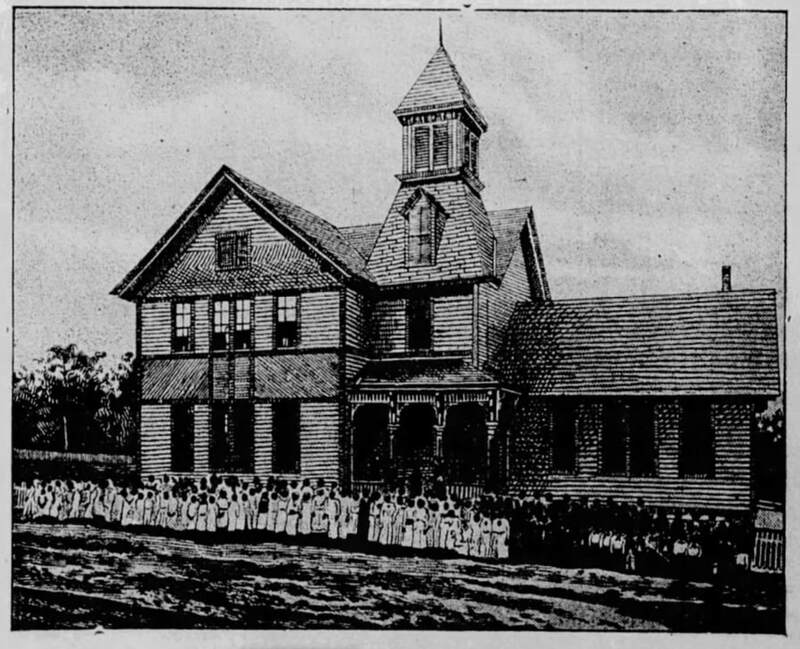 Image: "Colored Public School," Tuscaloosa Weekly Times, May 12. 1899. In the Presbyterian General Assembly South, at Knoxville, Tennessee, last Saturday, encouraging reports were presented from the Union and Columbia Theological Seminaries. Rev. Dr. McIlwain, Secretary, at Baltimore, read annual report on the Sustentation and Foreign mission. More Churches are contributing to these causes than heretofore, yet this is a lack of funds to carry on the work efficiently. Rev. Dr. J. N. Waddel, Secretary, reported on education that 150 were studying for the ministry. More mans were needed to aid the students. Rev. Dr. Stillman reported that ten students were studying at the colored institute at Tuskaloosa, Ala., for the ministry. More would attend if aid was offered them. Rev. T. H. Chambers, D.D. , here from New York as a delegate from the General Assembly of the Reformed Dutch Church, was presented to the Assembly. The case of Dr. E. T. Baird, against the synod of Va. was concluded by the General Assembly, on May 25th. His complaint was not sustained. The indebtedness of the Publishing Committee, all told is $38,000. They recommend the sale of the Publishing House in Richmond. The Publishing is now done in St. Louis, by contract. Drs. Armstrong and Reynolds appointed a committee to superintend the printing of the Revised Book. The Methodist General Conference, says the S.W. Presbyterian, is doing valiantly. It has taken action favoring a Methodist Ecumenical Conference, and for a celebration of the first centennial of American Methodism to be held in Boston, Dec. 25th 1884. The Methodist General Conference adopted an important report, declaring it to be the duty of the M.E. Church South to do all in its power to cherish the educational interest of the Colored people of the South, and pledge Church to do so. Source: “General Assembly,” Tuscaloosa News, May 30, 1878, 3. Source: “Colored Institute,” Tuscaloosa News, May 30, 1878, 3. We regret that other engagements prevented our attending the Exhibition of Jerry Barnes’s Colored School last Thursday evening, because we desire to know how they are taught, what is taught them, and to do this one must go to the place where they are taught and learn for himself. – We understand the children acquitted themselves very handsomely; speaking with remarkable ease and a fair degree of correctness. We feel a deep interests in the welfare of the colored people, and are glad to know of any effort on their part to better their condition. While they cannot hope, nor do we expect, any great number of them to reach eminence in learning, yet it is a duty they owe themselves, the community they owe themselves, the community and the State, to use every means of refining, educating, and elevating themselves and their race. By education they become better laborers, more intelligent farmers, and are better able to comprehend the duties of citizenship. It is our candid opinion however that they ought to let politics alone. We are in favor of granting them all the rights of citizenship, - but having this great responsibility thrust upon them without any preparation, they were and are not now in a condition to act with that intelligence which in a proper sense, constitute the good citizen. If they ever attain any degree of excellence, they will owe it to their own persevering efforts. We have no prejudice on this subject which are inimical to the highest interests of the colored race. We never wood have enfranchised them, but now that it has been done, by the results of the war we would not for any consideration remand him to his former condition. There should be no antagonism between the races. We feel none toward them, and are glad to help them establish schools and do rejoice in their educational improvement. But the Caucasian race must, will and ought to govern in State affairs. – Those of them who dream of social equality, and those bad men who prompt and feed the morbid desires are fools and enemies to both races. Source: “Colored School Exhibition,” Tuscaloosa News, August 1, 1878, 3.